Chris just releases the article + top 10 earlier, the top 40 still comes around the usual time. Ok, but that's the 3rd time in a row it happen, so should we expect this every weeks or nay? Sony don't tend to give out sales milestones, the only game with a second sales update from Sony was Horizon, where after a year they casually announced it had sold 7.5 million. After GOW has been out for a year, then we might hear how the game has done. GOW deserves this and then some, it is an incredible game. Do we have sales data for Horizon after a month? It's a nice comparison since we know how the game has done after a year. GoW beasting wow. Great numbers. Horizon got 2 update after the first week PR. The first after 2 months and the second after 1 year. Uncharted 4 got an update after (around) 7 months. Bloodborne got 2 update as well. Uncharted got a 2.7 million and 8.7 million annunce. Bloodborne too they annunced 1 million and then 2 million months after that. I'm also pretty sure DriveClub, TLOU and many others games got multiple annunce for sales milestone. Tropical Freeze has already sold more copies than both Nintendo Labo products combined. Glad Europe is saying no to Labo. Come back at me when the French rankings are revealed tomorrow. Might be different, might not but it'll be interesting nonetheless. labo's US performance will be interesting. eh, no point in responding. for now it's drops aren't good. but it's going to be a long haul either way. But engaging in discussion with people who say "I want this to bomb really really hard" will lead to what? Yeah, any comparisons to Horizon and UC4 after a month would be appreciated. In fact UK market is very different from the other EU countries. For starters it's the only country where Xbox is still relevant, it's the only country where Xbox outsells or sells like Switch, it's the only country where you'll find Xbox games on the top 10 etc. Sure, tomorrow's French rankings will be interesting. But at the same time if the UK is an abnormality and doesn't represent the entirety of Europe, so should France be. It's literally the only country other than Japan where Switch game can almost entirely own the Top5. As if the ranking will determine the amount of units sold. I used to be confused by the UK market but after thinking about it it's actually one of the more interesting ones considering how well Sony, Microsoft and Nintendo are doing there. Surely PS4 has a big lead but it's not like the other two are selling significantly worse compared to other markets like France, Spain or Japan where just one or two platforms are relevant. French rankings will be labos first week. I’d be more interested if it immediately falls out the second week. Nah I'm 99.9% sure that tomorrow's chart will be LABO's second week. I recall the variety pack's debut last week at no 2 caused some.... childish reactions here- and an unfortunate but expected general mod warning. That's not true. They're usually forthcoming with sales of their popular titles. Even in the PS3 days we got sales updates got tlou, heavy rain, uncharted etc. Whilst it's great to see a strong second week for DK:TF, it's also not all too surprising as I feel as there's not a huge amount of exciting new games out there to buy at the moment. May and June seem like very quiet months, although I'm sure we'll get high entries soon from Decay 2, Detroit and Dark Souls. Maybe you're confusing with EU? I meant that UK is only a part of Europe, especially if we are talking about videogames market. The UK market is really specific in the European landscape. US numbers are going to be quite interesting if we get them. It shares a lot in common with the Spanish market for example. Great legs for GoW! Even tho it deserves to sell better than any game this gen, but still, great legs. Like the French love for Football games and GT or their love You Watch right? Better is a strong word. It sold about 800k units, less than the X1. Take JRPGs for example, you'll see that franchise like Yokai Watch has met great success in France/Spain, and not so much in the rest of Europe. I can provide you a list of software sales if you want, but I dont understand why you cant see that the UK is quite an outlier in Europe. It is the only country where the Xbox sells well for example. 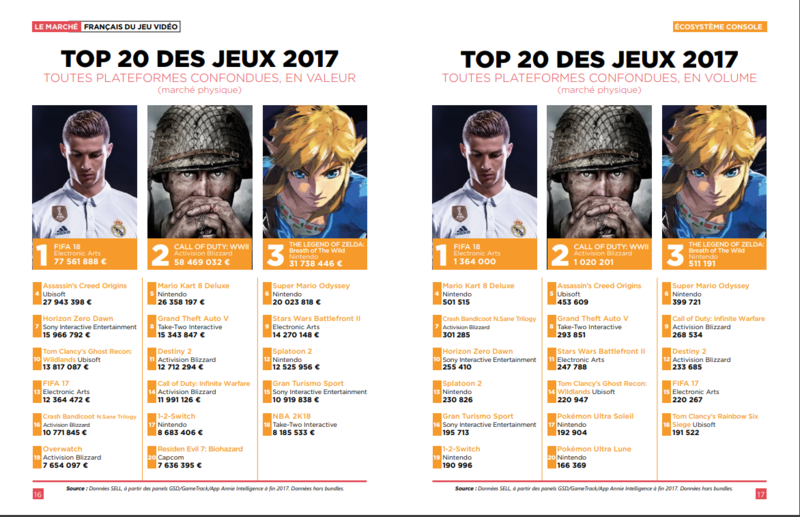 If it wasn't for GOW, Nintendo would be owning the entire French Top5. The Spanish market ain't doing it. France and Spain have way more in common than they do with the U.K. Pretty darn close to me.